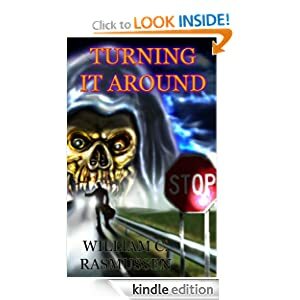 My INFINITY TWICE REMOVED co-author William C. Rasmussen has just released his newest novella, TURNING IT AROUND. It’s a fun story that kind of reminds me of a supernatural version of THE HITCHER. Well worth the read! Check it out HERE! When 21-year-old Ian Masters and his friend head west to San Diego by Greyhound bus to visit his friend’s relatives, Ian isn’t prepared for the worst case scenario. But when he quickly runs out of money and his friend flies back to Memphis without him, Ian is forced to hitchhike halfway across the country to return home. Along the way he encounters a wide variety of people, who offer him advice and suggestions to help him change his altogether unsavory lifestyle. But Ian isn’t ready to turn his life around just yet. And when it comes time to pay the Piper, he also isn’t ready to face the true cost of the consequences of his actions. This entry was posted on October 11, 2012 by evilanche. It was filed under Uncategorized .